I have had a bit of a break over the past few weeks. Partly because I’ve felt a bit bored and demotivated with cooking for just myself, partly because I’ve had some things going on around me, and partly because I just haven’t felt like writing. I guess with a steady readership of two (you know who you are!) I can take that luxury without upsetting people. But now I’m back and so with a bang. I have written up a new meal plan for the coming two weeks (and the plan is to keep deciding what to eat two weeks at a time) with five new recipes in it so far and I technically have five recipes for you in this post. That’s right, five. And one of them has three variations to it. The company I work for offers each employee a complete health check once every three years. Because it’s my first year with the company, I was offered one this year. They did a blood test which checked all your blood levels, iron, glucose, the health of your liver, etc. etc. and then there was a follow-up with a doctor where you got to check your weight, BMI, muscle and fat (percentage), lung capacity and ‘age’, eye sight, hearing, EKG and more. It was really interesting and I was happy with most of my results. The doctor said I was very healthy and I had a higher muscle mass percentage than the average woman (who apparently lies within a range of 24-30%) but I would like to improve my fat mass. And that brings me back to food – so now I’m going to renew my efforts of making good, and preferably healthy, meals as well as trying to keep myself accountable through keeping track of what I eat. I might, however, try not to make 2-4 portions rather than 4-8 so that I don’t grow bored of what I’m eating – especially if it doesn’t turn out the way I thought it would. But before we get to all that we need to look back at what was my birthday dinner party a little over a week ago. S and I had invited my oldest friend and her boyfriend over for dinner and they are such foodies. I was terrified lol! Definitely had some major performance anxiety going on. Then there was only the starter left. I had looked at maybe making some pick and mix bruschetta style bites, but then S came and said why don’t we make gravlax? We decided on doing three versions; traditional dill, the beetroot and gin one from Christmas, and a citrus one he found online. Both the starter and the dessert also worked in well with my ‘do-as-little-as-possible- while-they’re-here’ approach, since the salmon needed to be cured for three days and would be ready to slice upon their arrival, and the chocolate fondants could be made and kept in the fridge for up to 24 hours before baking. All I would really need to do once they were here was slice some salmon and bread, make mash potatoes, and put the fondants in the oven. So from the top down, here are the recipes (including the beetroot gravlax – slightly modified). Unfortunately for the blog I didn’t take any pictures since it was a party after all, so you’ll have to make do with pictures of the leftovers in the case of the starter and main and the trial run for the dessert! Place the salmon in a plastic bag. Mix salt and sugar and rub onto the fish. Sprinkle a few drops of water (or gin in the beetroot and gin version) over the mix, then add the condiments for your chosen version (i.e. dill or beetroot or the citrus zest mix). Put the fish in a plate or tray of some sort, skin-side up, and leave in the fridge for three days, turning once a day. If necessary, cut off any large bits of fatty membrane. Season the cheeks with 1 tsp salt and some pepper. Heat 2 tbsp oil in a large pan and sear the cheeks. (I don’t usually sear my meat for the slow cooker, but this time I did, since it was a ‘fancier’ recipe.) Set aside on a plate and cover with foil. Turn down the heat and add 1 tbsp oil. Sauté the onions, carrots and minced garlic for about 3 minutes, or until the onion has become translucent. Add the onion mix to the slow cooker and place the meat on top. Return the pan to the heat and pour in 500 ml wine. Leave to simmer for a minute, then pour into the slow cooker, including all the brown bits stuck to the bottom. Add stock, thyme, bay leaves, 2 tsp salt, and some black pepper to the slow cooker, then cook for 6-8 hours. When the cooking is finished, remove the cheeks from the slow cooker and discard the bay leaves. Blend the sauce with a handheld mixer until smooth and add the remaining wine. Pour it all into a saucepan and leave to simmer for about 10 minutes, or until it has reduced enough for your liking. You can also add some cornstarch mixed with water as a thickening agent if you would like to. At this stage, as I knew I was returning the meat and sauce to the slow cooker to keep warm, I also added some mushrooms, carrots and pearl onions. You can also make this as a non-slow cooker recipe and the instructions for that can be found in the original recipe. Mince the garlic and add to a saucepan with just a touch of butter. Brown for a few seconds, then add cream and bring to simmer. Set aside. Drain the potatoes then mash them and add the garlic cream and the parmesan, stirring to combine. Melt butter, sugars and syrup in a heavy-based pan. Let simmer for about 3 minutes, stirring every now and then. Add cream and salt and stir to mix. Remove from heat and leave to cool. Brush your moulds with melted butter and place in the fridge to cool. Once cooled, repeat, then dust with cocoa powder. Set aside. Divide chocolate and butter into small pieces and place in a water bath (a bowl on top of a simmering pot of water – but not touching the water). Stir until completely melted. Set aside to cool. Whisk eggs, egg yolks and sugar to a thick, fluffy, white-ish mix. Fold in the flour, then the melted chocolate – one third at the time. If you do not want to make caramel filled ones, fill to about three quarters. Leave in the fridge for at least 10 minutes before baking. If you do want to make caramel filled ones, fill to just under half, then place something in the middle to make a hole. I used egg cups wrapped in cling film, which was a bit sticky. 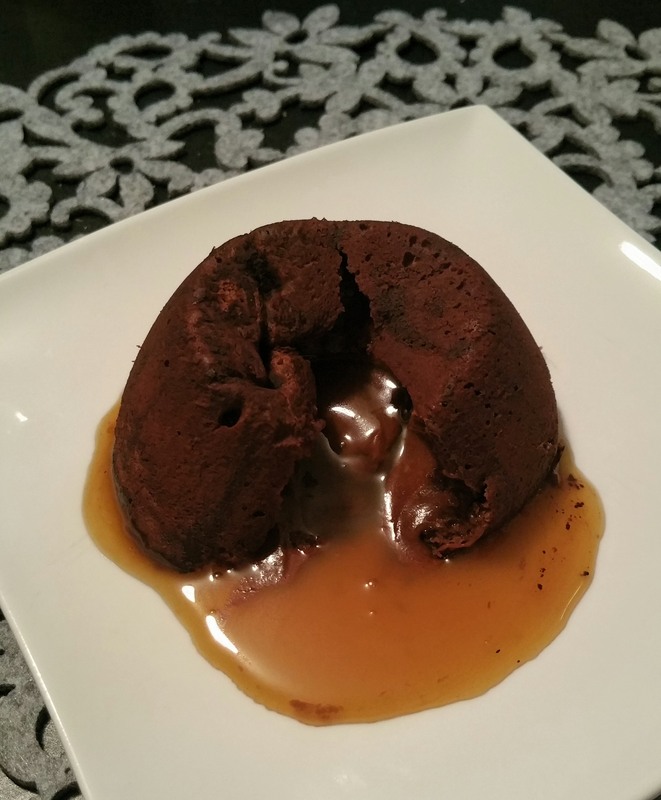 Leave to cool for 10 minutes, then remove your objects and fill the hole with caramel sauce. Cover with more fondant mix (which has been kept outside the fridge) and make sure it goes all the way to the edge, not just covering the top. Leave to cool for another 10 minutes – at least. Bake for 10-12 minutes at 200 degrees Celsius. The citrus salmon was quite sweet. I think halving the orange zest and upping the lemon and lime zest would be better. 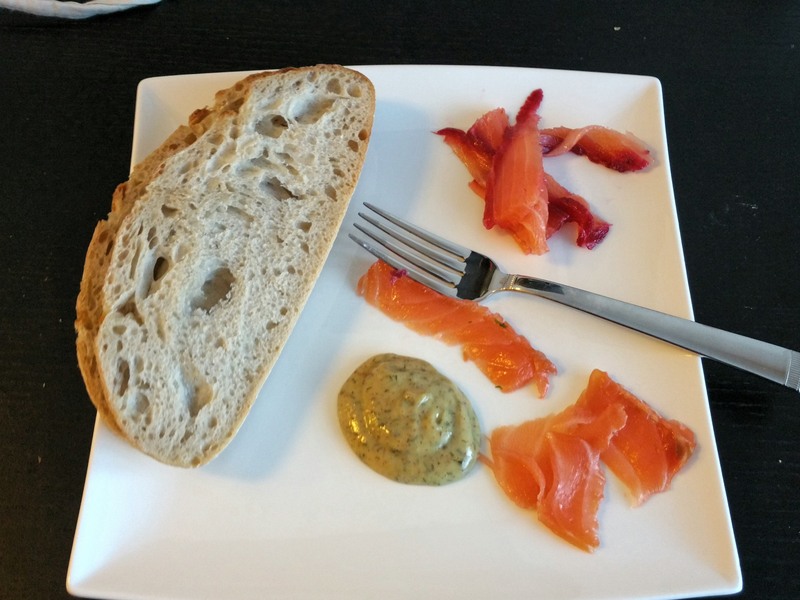 Also, last time I made gravlax I used the 1:0.5 ratio where you have half the amount of salt to sugar. I thought that was too sweet, so this time I did 1:1. 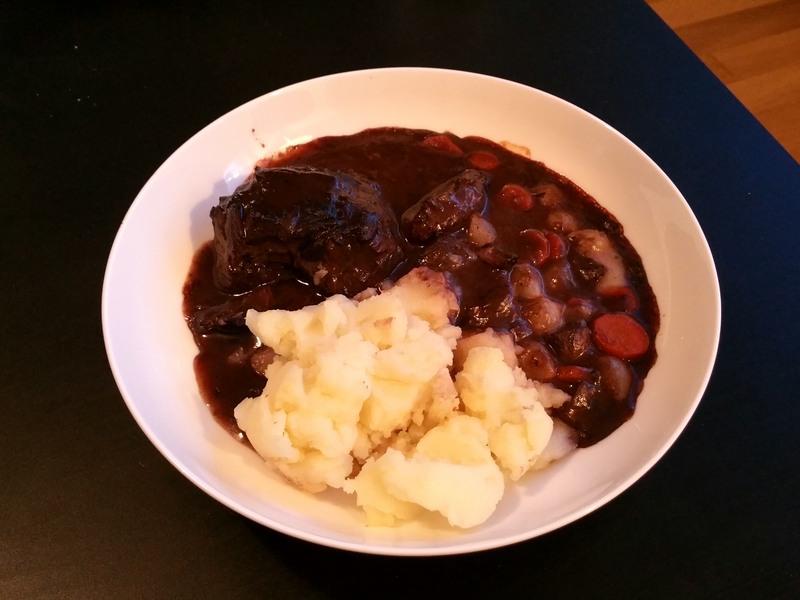 I cooked my ox cheeks for 6 hours on low, because I knew they would be keeping warm, and as such ‘after-cooking’, for another 2 hours. If you’re going to eat yours at once, you might want to cook them for 7-8 hours instead. For the mash, make sure the cream is really heated or the mash will get cold. I would also recommend seasoning it with salt and pepper. For my dessert I made two batches of salted caramel sauce – one that I made the day before and left in the fridge overnight to solidify a bit and one that I made just before our guests came and left out in a sauce jug to cool. If you’re using the sauce as an actual sauce (i.e. not as a filling) I would recommend not putting it in the fridge, as I felt that it went too solid to pour properly then. Definitely a good birthday dinner.